As Russ noted some time ago, you never want to be the guy who heats up a fish dish in the microwave at work. No matter how tasty it might be, it puts a weird smell in the air. Always. Your co-workers will hate you. I learned that the hard way. But have you ever noticed that the exact opposite happens when you heat up Italian? Suddenly, you become uber-popular and everyone's interested in what you're eating. And it doesn't have to be something from a fancy restaurant or homemade. I mean you could nuke a bowl of Chef Boyardee, and if it weren't for people recognizing the classic shape of spaghetti-o's, you could probably get the whole lunch room fascinated with your meal. Sprinkle some parmesan cheese on top, and your associates might start asking you to cater their weddings and bar mitzvahs. Sterile office environments and the mundanity of the workaday world somehow enhance people's interest in food. Fragrances seem so much stronger when smelled from a cubicle. And this cannelloni smells delicious. Even when heated in the microwave. To the best of my knowledge, I've never had cannelloni before in my life. But in this instance at least, it's basically lasagna. There are flat sheets of egg pasta with ricotta cheese and tomato sauce—oh, and bechamel sauce. Where have I heard that before? Hmmm...oh yeah! Our very first review, nearly four years ago. My first experience with bechamel left a bad taste in my mouth, and I wasn't quite sure if I'd ever be re-acquainted with the stuff. Well here we are, bechamel, face to face again. 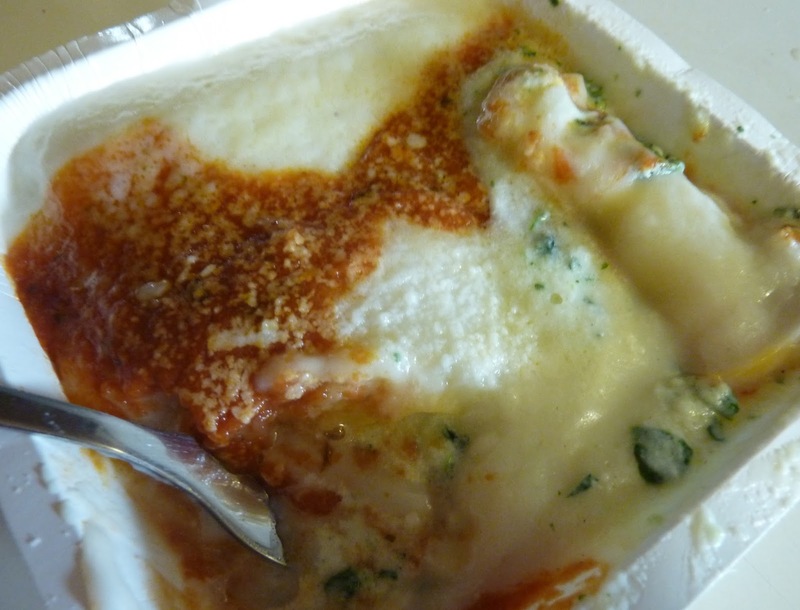 And on this serendipitous encounter, the bechamel is part of a similarly-packaged lasagna-esque dish just like last time, but now it's got better taste. I mean, I can't quite distinguish the bechamel from the pasta, ricotta, spinach, and tomato sauce. So I still couldn't tell you what it tastes like. But now I won't associate the word "bechamel" with nastiness. 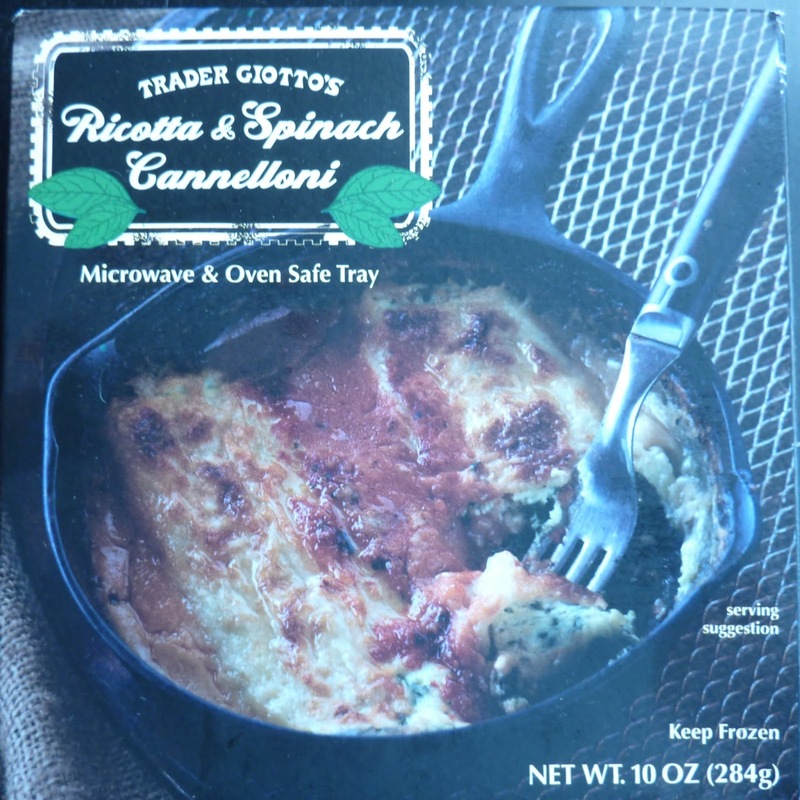 The flavors that I could taste were very well balanced, and I never found myself wishing the cannelloni had any kind of meat or meat sauce, as I often do with vegetarian Italian. There was plenty of pasta and ricotta. If anything was slightly lacking, it was the spinach. The dish required an extra minute of heating, bringing the total time in the microwave up to eight minutes. That's not unreasonable, considering what you're getting. I'm sure it would have turned out differently with a more traditional heating method, but the product was fairly soupy when it emerged from my electromagnetic particle disruptor oven. 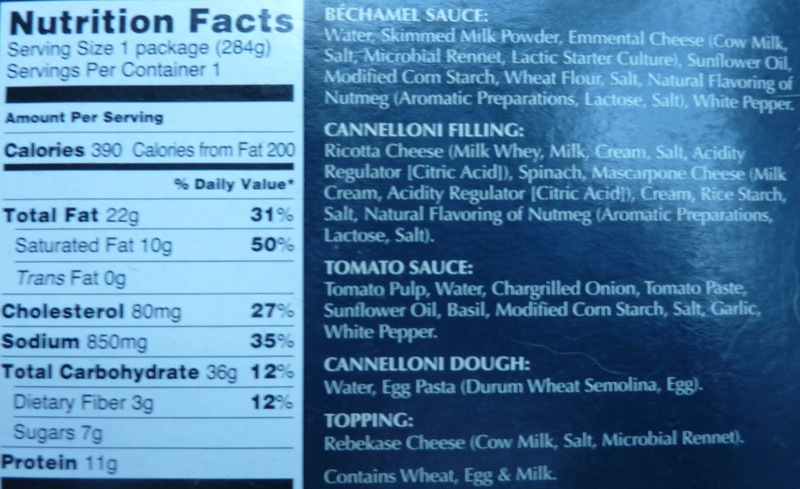 All of the sauces and cheeses created a wet conglomeration in the bottom of the microwave-safe heating carton. It was messy but tasty, easy, cheap ($2.49), and fast. Oh—and it smells really good, too. Heating it up at work just might make you the most popular guy in the lunch room. Sonia sat this one out, so I'll score it on her behalf. I'm torn between a 3.5 and a 4, so I'll give it one of each. You are spot on with the observation about heating up Italian making you the most popular person in the office! I regularly bring TJ's Clam Linguine Pasta (that may not be the technical name, but that's the essence of it...in the frozen aisle) and people flock from miles around to find out what kind of delicacy I'm heating up! Luckily it tastes as good as it smells...and I really love the jealous stares while people sadly eat their ham sandwiches. Hahaha! Ham sandwiches are kinda sad, aren't they? I'll definitely have to look for the clam linguine! Never heard of it before. Thanks for the rec, Erika. So the delicious aerial potency of mirowaved Italian outmusters the pungent calamity of nuked seafood in the same dish? Interesting. Definitely worth trying out. This looks DELICIOUS! And a good Friday meal, being meat free. This will definitely go in my cart next time! Mmmmmmmmmm, this certainly looks like it tastes delicious!